Place flour, sugar and salt in the work bowl of a food processor; pulse to blend. Add butter; pulse again to combine until mixture looks like coarse cornmeal. In small bowl, whisk together egg and vanilla; add to the butter-flour mixture. Blend until the dough begins to pull together. Remove and knead lightly if necessary. Then form a disk, wrap with plastic and refrigerate for about 30 minutes. Remove the dough to a floured work surface and roll out to 1/4-inch thick. Line a 12” removable-bottom tart pan and trim to fit. (You will have extra dough.) Refrigerate for about 1 hour. Preheat oven to 350°. Line chilled pastry with foil and fill with pie weights or dried beans. Bake tart shell for about 5-7 minutes; check the edges of the pastry to see that it has begun to cook. Remove pie weights and foil. Continue baking until pastry is partially cooked and just beginning to brown on the edges. Remove from oven and fill with caramel-nut filling. 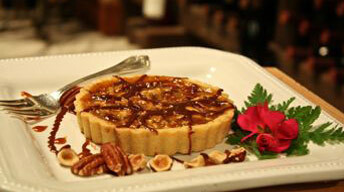 Place on a lined baking sheet and then back into the oven for about 15-18 minutes, or until the caramel is bubbling. Remove from oven; let cool at room temperature. Drizzle with the milk chocolate ganache. Place sugar, lemon juice and water in a heavy-bottomed saucepan. Heat over medium high heat, stirring often until the sugar melts. Brush down the sides of the pan to avoid having the sugar crystallize. Bring to a boil; continue cooking until mixture caramelizes to a medium-amber color, about 335°F. Remove from heat and add the cream, be careful as the mixture will steam. Then stir in the butter, vanilla, salt, and the nuts. Boil cream and pour over the chocolate. Stir until completely melted. Drizzle over finished tart.